The trend is your end. In “Black box” blues I argued that automated trading was a potentially dangerous element to include in a quantitative investment strategy, citing the “program trading / portfolio insurance” crash of 1987. When the market started falling in 1987 the computer programs caused the writers of derivatives to sell on every down-tick, which some suggest exacerbated the crash. Here’s New York University’s Richard Sylla discussing the causes (care of Wikipedia). The internal reasons included innovations with index futures and portfolio insurance. I’ve seen accounts that maybe roughly half the trading on that day was a small number of institutions with portfolio insurance. Big guys were dumping their stock. Also, the futures market in Chicago was even lower than the stock market, and people tried to arbitrage that. The proper strategy was to buy futures in Chicago and sell in the New York cash market. It made it hard — the portfolio insurance people were also trying to sell their stock at the same time. [If] you feed the same data into computers in search of anomalies, they are likely to come up with similar answers. This can lead to some violent market lurches. The model can range across markets and go short (bet on falling prices) as well as long, so the theory is that there will always be some kind of trend to exploit. A paper by AQR, a hedge-fund group, found that a simple trend-following system produced a 17.8% annual return over the period from 1985 to 2009. But such systems are vulnerable to turning-points in the markets, in which prices suddenly stop rising and start to fall (or vice versa). In late 2009 the problem for AHL seemed to be that bond markets and currencies, notably the dollar, seemed to change direction. The value effect works on a much longer time horizon than momentum, so that investors using those models may be buying what the momentum models are selling. The effect should be to stabilise markets. This ceaseless activity, however, has led to a kind of arms race in which trades are conducted faster and faster. Computers now try to take advantage of arbitrage opportunities that last milliseconds, rather than hours. Servers are sited as close as possible to stock exchanges to minimise the time taken for orders to travel down the wires. A previous example occurred in August 2007 when a lot of them got into trouble at the same time. Back then the problem was that too many managers were following a similar approach. As the credit crunch forced them to cut their positions, they tried to sell the same shares at once. Prices fell sharply and portfolios that were assumed to be well-diversified turned out to be highly correlated. Computer-driven hedge funds must hunt for new areas to exploit as some areas of making money have become so overcrowded they may no longer be profitable, according to Goldman Sachs Asset Management. Robert Litterman, managing director and head of quantitative resources, said strategies such as those which focus on price rises in cheaply-valued stocks, which latch onto market momentum or which trade currencies, had become very crowded. What we’re going to have to do to be successful is to be more dynamic and more opportunistic and focus especially on more proprietary forecasting signals … and exploit shorter-term opportunistic and event-driven types of phenomenon. Computers may not have the human frailties (like an aversion to taking losses) that traditional fund managers display. But turning the markets over to the machines will not necessarily make them any less volatile. And we’ve come full circle: Human’s are flawed, computers are the answer. Computers are flawed, humans are the answer. How to break the deadlock? I think it’s time for Taleb’s skeptical empiricist to emerge. More to come. Taleb’s ideas appeal to me for a variety of reasons: I see Montaigne’s “Que sais-je?” (“What do I know?”) as a golden thread linking Austrian economics, value investment and a variety of other views I hold unrelated to finance and investment. Benjamin Graham, being the Latin, Greek and French-speaking polymath that he was, no doubt enjoyed Essais in its original form (whereas I had to grit my teeth through the Cotton translation, before learning that connoisseurs prefer M.A. Screech for his lyrical Raymond Sebond). Montaigne may have had some influence on Graham’s concept of margin of safety, his habit of professing to know little about the businesses of the securities in which he invested, and generally cautious and conservative approach. Montaigne writes about about the failure of his own faculties to aid him in his comprehension of the world. We don’t even understand the past – despite our “fantastic, imaginary, false privileges that man has arrogated to himself, of regimenting, arranging, and fixing truth” – so how can we possibly see what will happen in the future? We can’t. The beauty of Montaigne is that he presents a way forward through the gloom. How do we proceed? Through waver, doubt and inquiry. Taleb offers a similar view in Fooled by Randomness and The Black Swan, and that’s what makes the books so enjoyable. He didn’t talk much, so I observed him,” Taleb recalls. “I spent seven hours watching him trade. Everyone else in his office was in his twenties, and he was in his fifties, and he had the most energy of them all. Then, after the markets closed, he went out to hit a thousand backhands on the tennis court.” Taleb is Greek-Orthodox Lebanese and his first language was French, and in his pronunciation the name Niederhoffer comes out as the slightly more exotic Niederhoffer. “Here was a guy living in a mansion with thousands of books, and that was my dream as a child,” Taleb went on. “He was part chevalier, part scholar. My respect for him was intense.” There was just one problem, however, and it is the key to understanding the strange path that Nassim Taleb has chosen, and the position he now holds as Wall Street’s principal dissident. Despite his envy and admiration, he did not want to be Victor Niederhoffer — not then, not now, and not even for a moment in between. For when he looked around him, at the books and the tennis court and the folk art on the walls — when he contemplated the countless millions that Niederhoffer had made over the years — he could not escape the thought that it might all have been the result of sheer, dumb luck. I’m not going to recapitulate Gladwell’s article here, but it’s well worth reading in its entirety. As an aside, Niederhoffer’s The Education of a Speculator is also an excellent read. It is interesting to compare Niederhoffer’s exhortation to “test everything that can be tested” against Taleb’s “naive empiricist,” but I’ll leave that for another day. For me, one of the most interesting aspects of Taleb’s philosophy is his attack on “epistemic arrogance” and its application to value investment. 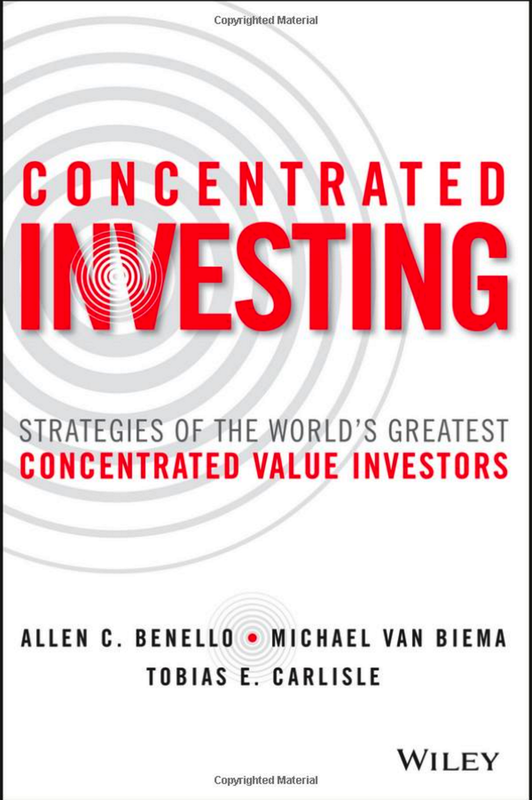 As I have said before, I believe there are several problems with the received wisdom on value investment, and this is one worthy of further exposition. Our main method used to classify was to look for the term quantitative or a description of a similar nature to place a fund in the quantative category. We also looked for words like discretionary to classify qualitative funds and systematic to classify quantitative funds. Of the four main hedge fund categories, we only found two of them reliable enough to classify. Thus, in the Equity Hedge category, we classified Equity Market Neutral and Quantitative Directional as quantitative hedge funds and Fundamental Growth and Fundamental Value as qualitative categories. We did not classify any of the Event Driven funds since these funds vary too substantially within the category and it was not clear from the descriptions how to separate quantitative and qualitative funds. We also did not classify any of the Relative Value funds, even though many of these funds use quantitative techniques, because the broader descriptions left us no clear cut way to divide them. We classified a fund as quantitative if the following words appeared in the fund description: quantitative, mathematical, model, algorithm, econometric, statistic, or automate. Also, the fund description could not contain the word qualitative. We classified a fund as qualitative if it contained the word qualitative in its description or had none of the words mentioned for the quantitative category. Generally, quantitative funds have a higher average return and a lower average standard deviation than qual funds. 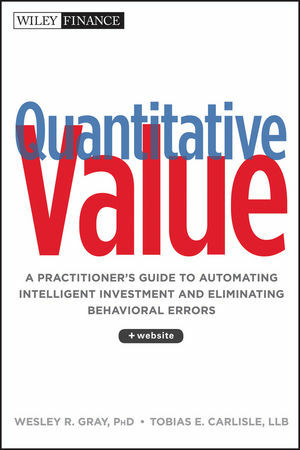 Amongst the quant funds, the highest average return comes from the Quantitative Directional strategy. The correlations of the fund categories with the S&P 500 are quite low at 0.17 and 0.38 for quant and qual respectively. The risk-adjusted return measures provide mixed evidence, but overall seems in favor of quant funds. The qual funds perform significantly better than quant funds in up markets (25% and 15% respectively). However, the quant funds do significantly better in down markets (-2% versus -16%). This is mainly driven by the presence of Equity Market Neutral funds. In the 1990s, the average qual fund return was higher than the average quant fund return. They were roughly the same from 2000 – 2009. 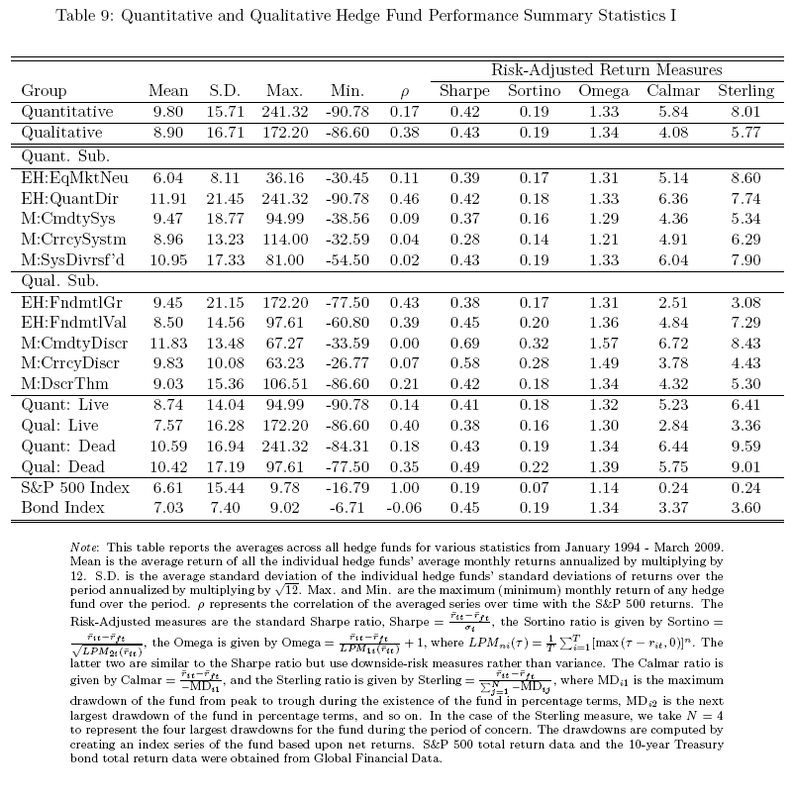 During the financial crisis (which we measure from January 2007 – March 2009), quant funds did better than qual funds (3.29% versus -4.77%). …the breadth of selections, the elimination of behavioral errors (which might be particularly important during the financial crisis of 2008 – 2009), and the potential lower administration costs (after hedge fund fees). The disadvantages for quantitative hedge funds include the reduced use of qualitative types of data, the reliance on historical data, the ability to quickly react to new economic paradigms. These three might have been especially crippling during the financial crisis of 2007 and 2009. Finally, there is the potential of data mining, which will lead to strategies that aren’t as effective once implemented. In this paper, we will only focus on the return differences rather than attempting to detail which of the advantages or disadvantages in central in the return differences.